The Silk Trio, a group of innovative string players specializing in the music of China, plays at 7:30 p.m. Friday, March 14. Tickets cost $10, also available at batestickets.com. The Olin Arts Center Concert Hall is located at 75 Russell St. A limited number of free tickets for students and seniors (65-plus) are available for Danú (after March 10), Silk Trio and Cuarteto Quiroga at bit.ly/oacbates. For more information, please contact 207-786-6163 or olinarts@bates.edu. The Silk Trio comprises Chinese musicians known as both effective proponents of the music of China and as masters of their instruments. 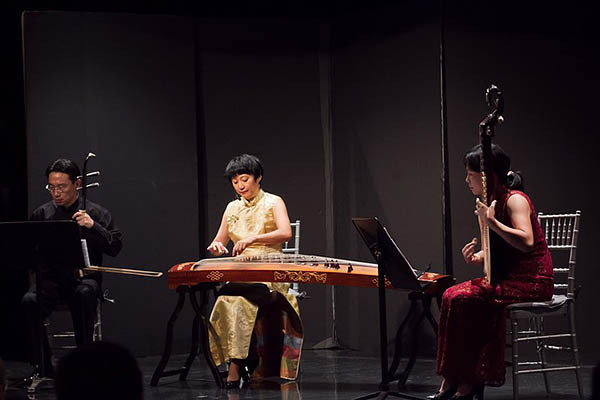 Ann Yao plays the “zheng,” a plucked zither; Wang Guowei, the “erhu,” a two-stringed fiddle; and Yihan Chen, the “pipa,” a pear-shaped lute. Born into a family of musicians in Shanghai, Yao grew up immersed in Chinese folk and classical music. She moved to the U.S. in 1985, and has performed at Lincoln Center, Carnegie Hall, the Metropolitan Museum of Art and other venues with the innovative ensemble Music From China, which promotes modern Chinese musical culture while preserving ancient Chinese music. Also a Shanghai native, Wang gained national prominence in garnering the prestigious Art Cup award at the 1989 International Chinese Instrumental Music Competition. He has toured to Singapore, Taiwan, Hong Kong, Belgium, Canada, England, Italy and Australia. Wang has been critically praised for his “extraordinary” and “gorgeous” playing. Chen garnered top awards at the 1995 Freedom International Chinese Instrument Competition, as well as the 1989 Art Cup. She has performed throughout the United States and appeared at major festivals in Asia, Europe and Canada. She has toured as soloist with the Hua Xia Chamber Ensemble (Beijing) and Music From China.